This article is about the model introduced in Halo: Combat Evolved. For the model introduced in Halo 5: Guardians, see Type-56 Needler. "Anything stuck with enough needles will blow sky high—and if a Foxtrot is unlucky enough to be carrying grenades, those are gonna cook off too." The Type-33 Guided Munitions Launcher, more commonly known as the needler, is a Covenant infantry weapon. A blueprint of the T-33 GML in the original Halo trilogy. A blueprint of the needler in Halo: Reach. The Type-33 Guided Munitions Launcher is a Covenant projectile weapon that fires long, sharp crystalline shards that are guided until they impale a target — hence the “needler” moniker. Several seconds after coming to rest in their target, the needles detonate, creating severe and in most cases fatal wounds. The needler's top plate has 14 holes, with the needles protruding out of the holes. When the trigger is pulled, the needle is fed from the top into the "barrel" of the weapon, and fired at high speed. The Type-33 GML is used by Covenant foot soldiers of nearly all types. Yanme'e are also fond of this weapon, and their efficiency with it is high as their flying capabilities and large numbers make the needles harder to dodge. When the trigger is held down, the rate at which the 'needles' are fired increases. Unlike most Covenant weaponry, the needler does not incorporate reverse-engineered Forerunner technology. 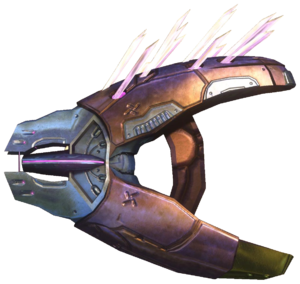 The needler was one of the most unusual weapons in the Covenant arsenal and the least understood; how the weapon functions remains a mystery to human military experts and scientists. Like most Covenant weapons, the T-33 GML lacks any kind of electronic, physical or radiative connections between its "trigger" and firing mechanism. However, post-war analysis and study have shown that the shards track their targets by homing in on the specific heat signatures of sighted targets. The physics behind the weapon were apparently not well known as joint human and Sangheili teams were known to be studying the weapon some time after the war. Razor-sharp crystalline projectiles made of Subanese crystal, or blamite, are fired from this elaborately designed Covenant weapon; it is widely believed that these needles use heat or organic signatures to home in on targets, and may have some relation to the Plasma Grenade and the Plasma Pistol's charged shots, which also react to living tissue and Sentinel mechanics. The needles appear to have some sort of "identify-friend/foe" function, as they will home in on hostile targets but not allies of the wielder. Once fired, a needle will seek its target until impact, entering the victim's body violently. After several seconds, the contents of the crystalline shard will detonate; injuries inflicted from the exploding shard are gruesome, as microscopic pieces of shrapnel can become embedded in tissue. The crystalline projectile appears to contain some type of gas or energy, which is released upon impact with a target; after seven or more needles have struck a target in the same general area, the needles will react to each other, triggering an explosion that kills the victim instantly. The explosion of multiple needles is a result of proximal resonance instability. When either a single or multiple needles detonate, they release crystal shrapnel, which can embed itself in nearby organisms; thus, friendly fire is often a necessary consideration in close quarters combat. The Type-33, unlike other Covenant weapons, allows the user to aim at the closest target, fire and move on, as its homing ability allows its user to avoid being exposed to enemy fire while inflicting his own. The more needle shards that impact the target, the higher degree of damage it will do to the target, seven or more needle shards detonating at the same place will cause a massive explosion that will cause splash damage and cause shrapnel damage, which can also cause nearby explosives to detonate, giving the enemy another reason to run. The projectiles ricochet when they hit rigid surfaces at oblique angles and retain sufficient velocity, making dodging them a challenging feat. The weapon is most useful on wide open maps, as even though it has a limited effective range, the projectiles can follow a target for a long time and will almost certainly hit anything slower than a banshee in Halo 4. In the very least, it is a good weapon at forcing an enemy into cover. However, in newer games such as Halo 4 and 5, the needler is more effective against shields than it previously was. While the Type-33 GML is incredibly effective against most infantry, it is much less effective against vehicles. The crystalline projectiles are slow and ineffective to even light armor and will simply bounce off of them. The needler is also limited to medium range combat situations and even at that range is not as effective, as the projectile travels it loses velocity and thus loses altitude, reducing the chances of impacting a target. In order for the tracking ability to be most effective the targeting reticule on the users heads up display must acquire the target, or if no targeting reticule is available the user must judge how close he must be to a target in order to effectively use the weapon. While the homing ability is incredibly useful the crystalline shard cannot track a target relentlessly, turning at a certain angle will cause the projectile to simply keep flying and miss the target completely, fast turns at certain angles will also cause the projectile to lose the target and travel onward. The needler is also ineffective against linear energy fields, like the Point Defense Gauntlets carried by the Kig-yar, or stationary energy shields; as the projectiles are repelled without detonating. Another, more minor disadvantage, is that the needler is unsuited to setting off explosive devices like Fusion Coils, often requiring several clips of ammunition to destroy one. Another disadvantage would be the Type-33 GML's lack of instant results, in other words one could shoot a target with the 7 needles required to super-combine, but be killed by that target before the needles detonate. Finally, the needler is suited to a very limited medium range. This is because the projectiles have too great a travel time for long range, and at close range, the target can simply move towards the shooter and attempt to kill them with the resulting explosion, thus rendering the attack useless. The needler makes its first appearance in Halo: Combat Evolved, and while its effectiveness was limited to close range, the needler was still dangerous if the player managed to get seven needles to hit an enemy target. The needler in the first game is larger than its Halo 2 and Halo 3 counterparts, and its maximum ammo is 80 needles. The needles' super-combine explosion could also cause nearby grenades to go off, and either do damage or kill nearby friendlies or enemy infantry. When viewed in first person, the needle shards that protrude from the weapon have a blue tinge to them until fired, then take on the pink coloring. The needler is now smaller, and is one of the dual-wieldable weapons. The needler's projectiles when viewed in first person now have a pink tinge to them instead of blue. The magazine size has increased to thirty needles. Maximum ammunition increased from 80 needles to 90 and its maximum amount of magazines decreases by one (20/80 to 30/90). Explosion has significantly less splash damage. Only one explosion will go off within an enemy, while in Halo: Combat Evolved multiple explosions could go off in one body, even after death. Slower rate of fire at approximately 450 rounds per minute. Melee animation is different, and attacks are faster than in Halo: Combat Evolved. However, they do less damage, due to the firing muzzle hitting the target, instead of the needles impaling the enemy. The explosion of the needler is stronger, about as strong as a plasma grenade. No more ammunition in magazine form on the ground. The needler projectiles will now aggressively follow a target, and will only appear to be locked on if the target is visible e.g. if a target goes into cover after being targeted the needles will fly about without homing in however if the target re-emerges the needles will lock on again once more. Deflected needles no longer track targets. The needler can no longer be dual-wielded. The needler super-combines in seven rounds. Magazine size has been decreased to 19 rounds but reserve magazine increased by 1 (30/90 to 19/76). Elites never wield needlers in-game unless given one by the player. Rate of fire has been dramatically increased to about 570 rounds per minute. The projectiles themselves also travel a lot faster, however their altitude decreases over time. The reload time has been decreased. The needler is more accurate. The needler is now smaller. The needles are significantly smaller, approximately half the size of those in Halo 2. The needler's projectiles tracking is less noticeable. Needlers are used as the Covenant's main anti-air weapon, appearing both on base defenses and on the Vampire anti-air ships as the heavy needle cannon. 12 needles are required to cause a target to explode. Jackals and Brutes can now use needlers by default. The stock of the needler has been significantly extended in context to the past three Halo games. Like the Needle Rifle’s projectiles, you won’t be rewarded with a super-combine until after your opponent’s shields have dropped. The needler originally featured a new reticule system that showed an indicator when it locked on and tracked a target, similar to the Rocket Launcher from Halo 2 and the Missile Pod from Halo 3. This feature was deemed overpowered and later removed with a title update from all game variants except for Invasion. The needler's magazine size has been increased to 24 rounds. The weapon now takes 6 needles to take down a Spartan-III's shields, 7 for an Elite's shields and 6 more needles to super-combine. The needler in Halo: Reach now looks more like the needler from Halo: Combat Evolved, including the shape and color scheme. The projectiles seem sharper, more solid, and more jagged. The melee attack will now swipe with the needles, as in Combat Evolved. The needler in Halo 4 is a different model of the weapon than that produced by the original Covenant; it is now produced by Lodam Armory on Sanghelios. The needler's housing has changed in color from brown to dark blue. The needler's magazine size has been reduced slightly, now with 22 rounds instead of 24, and with a maximum of 44 rounds. The needler super-combines with 6 rounds. The needler can once again trigger super-combine detonations on targets with intact shields. Enemies in Campaign and Spartan Ops can now score detonations on the player. The needler now appears to have bloom, which could be seen as redundant due to the fact the weapon's projectiles already follow its target. Once again can be dual-wielded. Stats are very similar to the Halo 2 incarnation. Has a magazine size of 30 rounds with 90 total in reserve but reserve magazine decreased by 1. Ammo capacity reduced considerably from 200 to 76. Super-combine increased from 7 to 8 rounds. Needler's maximum travel range increased. "I don’t know how it works, but it seems the needles can only follow you if they can "see" you." Instead of each needle on top of the Needler being pushed separately into the gun with each shot, every needle sinks into the weapon slightly for each shot fired. In Halo: Reach, a needle sinks into the weapon every time one is fired. It's never been shown how the Needler is reloaded, as ammunition is never seen being plugged into the weapon. Pressing the "reload" command merely causes the needles to extend from the holes, with no other action from the wielder's model. Grunts carrying the Needler may occasionally tap and shake the weapon as if to reload it. On the level Quarantine Zone in Halo 2, there is a lone Sentinel that fires Needler rounds and drops a Needler when it is destroyed. In Halo 3, regardless of how many needles are loaded in the weapon, none will appear in the Needler's shadow. Bungie.net's Halo 3 statistics page claims that the Needler has thirty needles per magazine instead of the actual nineteen. In Halo 3, killing five enemies with a Needler, in a ranked free-for-all match or campaign will reward the player with the Fear the Pink Mist achievement. In Halo 3: ODST, killing ten Covenant soldiers with an explosion from the Needler in a single player level or in Firefight will reward the player with the Pink and Deadly achievement. In Halo: Reach the player earns the A Spoonful of Blamite achievement for killing ten enemies with Needler explosions. Killing an opponent with a super-combine of the Needler's needles will grant the player a Super Detonation Medal in Halo 3, Needler Kill Medal in Halo 3: ODST and a Needle Combine Kill Medal in Halo: Reach. 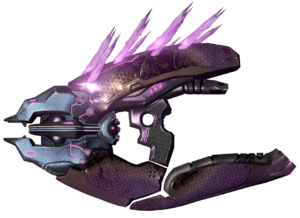 In Halo: Ghosts of Onyx, the Needler is referred to as a pistol. This may be because in the large hands of a Sangheili, it seems proportionally smaller. In Halo: Combat Evolved level 343 Guilty Spark and the Halo 2 Vista map Uplift are the only levels to feature Needler ammunition outside the Needler. When using Anniversary mode in Halo: Combat Evolved Anniversary, dropped Needlers are always depicted as either being fully loaded or empty with no middle ground. However, when playing Classic mode, the number of needles can be seen indicating how many remained in the clip prior to the weapon being picked up. In the video Enemy Weapon at 0:22 in left side of the screen is a Type-33 Needler in a glass case with needles still visible on the weapon, indicating that it is still loaded. Concept art of the Needler in Halo: Combat Evolved. First-person view of the needler in Halo: Combat Evolved. Needlers and their ammunition in Halo: Combat Evolved. A profile view of the needler from Halo: Combat Evolved. Close-up preview of needler ammunition in Halo: Combat Evolved. A profile view of the needler from Halo 2. First-person view of dual-wielding needlers in Halo 2 multiplayer Capture the Flag. First-person view of dual-wielding needlers in Halo 2. First-person view of single-wielding a needler in Halo 2. First-person view of the needler in Halo 3. A needler shard in mid-flight in Halo 3. Close-up preview of a needler shard in Halo 3. The needler in Halo 3. Another shot of the Halo 3-era needler. An in-game profile view of the needler from Halo 3. A profile view of the needler in the Halo: Reach Multiplayer Beta. A first-person view of the needler during the Halo: Reach Beta. First-person view of the needler in the final build of Halo: Reach. The final in-game side preview of the needler from Halo: Reach. First-person view of the needler in Halo: Reach. The needler in Halo: Reach. An exploded view of a needler, drawn by Dr. Halsey. First-person view of the needler in Halo: Combat Evolved Anniversary. HUD of the needler in Halo: Combat Evolved Anniversary. A needle embedded in Chyler Silva's stomach in Halo 4: Forward Unto Dawn. Render of the needler in Halo 4. First-person view of the needler in Halo 4. The needler viewed in the HUD in Halo 4's Forge. HUD icon of the needler in Halo 4. A needler shard in mid-flight in Halo 4. Closeup detail of the needler shard in flight in Halo 4. Reference model sheet of the needler in Halo 4. Orthographic views of the needler in Halo 4. First-person view of the needler in Halo 2: Anniversary campaign. First-person view while dual wielding. John-117 duel-wielding needlers during the Battle of Installation 05. First-person view of the needler in Halo 2: Anniversary multiplayer. A Spartan using a needler on Stonetown. A Spartan dual wielding needlers. A Spartan using a T-33 needler on Shrine. A needler on Diamondback in Halo Online.